It has been a long few weeks. I am trying as quickly as I can to get my house ready for my sister and her family. My house, will be a very cozy place in less than four weeks. I am moving bookcases. I am moving artwork. I am moving cocktail dresses. More on the latter at another point in time. I am playing interior designer, mover and shaker. Well, not so much a shaker. Oh, so many roles and so little time. Speaking of time, (this is one of my well-known tangents), did you hear what were David Cassidy’s last words, according to his daughter? According to Cassidy’s daughter Katie (as on her Twitter account) his last words were “So much wasted time.” Oh boy. That depresses me a tad bit. We all want to think we will lead a good, useful, life. But, in reality, I suppose there are many wasted moments. It is ok to waste time as that helps us decompress from all that surrounds and weighs us down. But do we want to be on our deathbed thinking of all those wasted moments? I suppose that is the fear that many people experience during mid-life. Henceforth, the mid-life crisis that so many people seem to go through at some point. But I am not here to talk about mid-life crises or wasted moments in life. I’m here to talk about pecan pie. 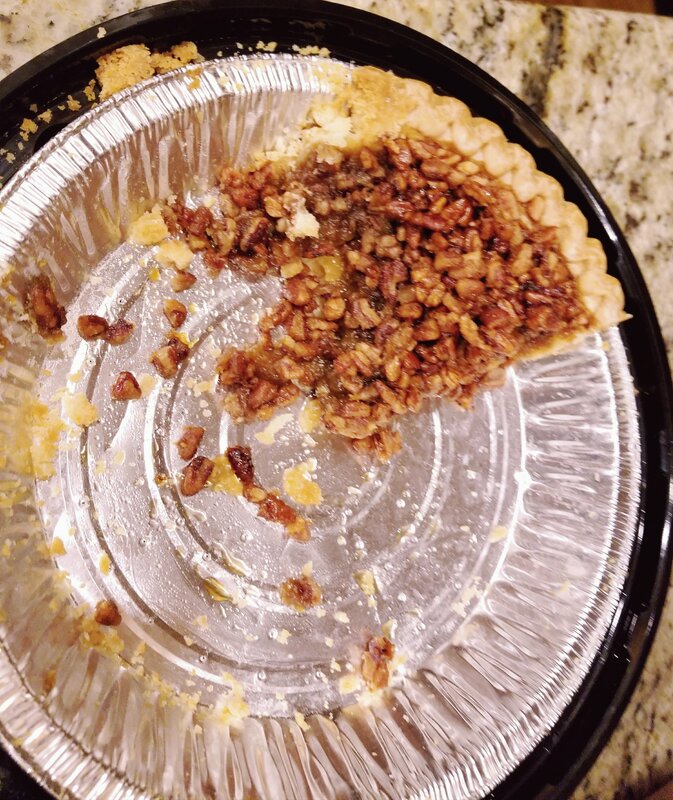 It’s been a bit in the news these days (well, at least some twitter feeds) as Sarah Huckabee apparently baked a pecan pie and she tweeted out a photograph of it. I, honestly, don’t care whether she baked it or not. I did NOT bake my pecan pie but I ate a most delicious one on Thanksgiving day. A friend, who came over for desserts and wine, asked what dessert I fancied. I told her I love pie. I don’t care much for cake. She then gave me the option of apple, pecan or pumpkin pie. I had to think long and hard about this. I love apple pie. You can’t go wrong with it. It’s simple yet delicious. I feel so wholesome eating it. With pumpkin pie, there is a set number of days that you tend to enjoy eating it. I personally would eat it year-long but not many places serve it year-long. I truly hate being so restricted. I am one of those that loves eating dinner entrees for breakfast. Why waste time and stick to such a scripted life, eh? Despite my love of apple pie and the short window frame for pumpkin pie, I chose pecan pie. Why? I didn’t want to waste time with something I tend to have quite often or something that I eat only because a certain time period dictates that I do so. Yes, I lied. David Cassidy wasn’t a tangent. I love pecan pie. Now, do you say pee-KAHN or PEE-can ? I tend to say pee-kahn. But It all depends on the time of day and how much of it I have eaten. Love Pecan Pie will make it one day! As for the pumpkin pie, yes it’s a seasonal dessert, but let me tell you a secret… if you read a bit of my blog I have a few editions on Pumpkin Season.. you can freeze pumpkin. Best way is to buy it, grate it, and bag it, in air tight freezer bags. This way you can have pumpkin pie any time of year 😊😉😉! Hope you enjoy the quality time with the family. I too have a hard time choosing between apple, pumpkin and pee-KAHN pie. This year a homemade French silk made with Mexican chocolate was one of the options. I couldn’t resist that. Your posts are always entertaining to read! I love your everyday dilemmas and musings.